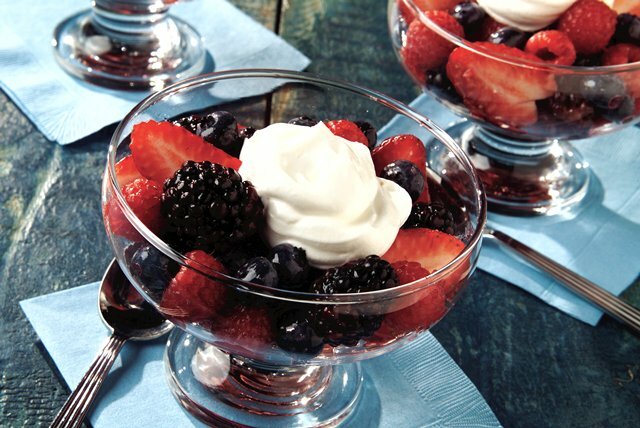 Sweetened berries are topped with a creamy blend of sour cream, whipped topping and orange peel for a refreshing summer dessert. Mix berries and 1 Tbsp. of the sugar in medium bowl. Let stand 10 min. Place whipped topping, sour cream, remaining 1 Tbsp. sugar and the orange zest in small bowl; stir gently until well blended. Spoon berry mixture evenly into 8 dessert dishes; top with the whipped topping mixture. Serve over shortcake for a delicious twist on an old favorite!